The Society welcomes the opportunity to present the wonders of the night sky to children of all ages and to interested adults. Programs are usually instigated by the interested school or group contacting our Education and Outreach Coordinator to discuss their ideas. A discussion will uncover the best approach for delivering an engaging and educational experience for everyone. 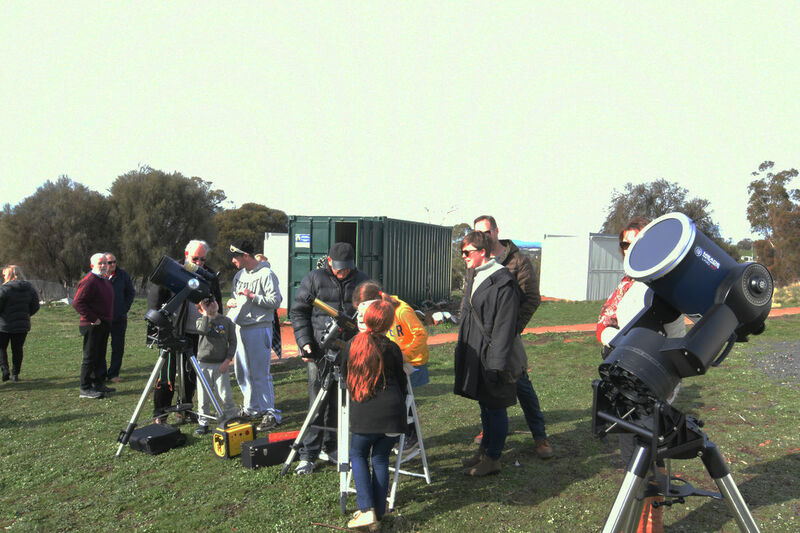 Viewing of the best night sky targets through telescopes provided and guided by members of the Society. Note that best viewing opportunities occur near the first quarter of a new Moon. These programs are conducted at the school’s or other interested group’s premises with the venue arrangements managed by the organizing group. Society members will provide the presentations and night sky viewing sessions with telescopes as arranged. The Society normally asks for a donation to cover costs and to help us raise funds for ongoing projects. We can discuss how this might be arranged. Further information on our Public Education and Outreach programs and how to arrange an event for your group, can be obtained by contacting our Education and Outreach Coordinator.